During the lunar eclipse, the children find the playroom, and Hallie seems possessed by a woman from an earlier time. She doesn’t remember this later, but Daphne’s ghost reappears to tempt her with a Regency-era dress. Meanwhile, a loveless Quentin spots Daphne’s grave, and a dream appearance by her becomes reality when lilacs mysteriously appear in the drawing room. On the podcast in which Wallace, Will McKinley, and I discussed NIGHT OF DARK SHADOWS, we agreed that the film was more of an art film than a horror movie. If that motif has a beginning for the franchise, it’s right around here. It’s tough to write about the Ragnaraok sequence without meditating on both its difference from the rest of the franchise and its representation of it. In fact, it’s becoming an annual tradition at the Daybook. It needs advocates, and those are tough to find. The reasons? As 1076 shows us, it’s not fun. It’s vaguely piebald when it comes to characters who’ve been with the program from the beginning. Barnabas and Julia seem more desperate and less certain than ever. Quentin is joyless and joylessly untrustworthy. Visually, the fashions and hair make it stand out wildly from what we’re used to from most of the show. Most importantly, it’s a downer. Other storylines are about averting probable doom. In this, it’s about witnessing a protracted inevitability. The minute we see characters in period costumes and know that at least two time portals exist within the house, it’s clear this is headed to 1840. Do we really have to see Maggie become diseased and insane and bedridden to make that happen? Soaps thrive on cliffhangers. Ragnaraok is a checklist of bad things we know will happen. The trick to this sequence is adjusting expectations. This is not Lyndon Johnson’s DARK SHADOWS; it’s Richard Nixon’s. And that’s okay. Before, the series was about who and what. Who was behind the door? What is Barnabas going to do next? Now, it’s more a show about when and how. Gerard is a prime sadist, and like a moodier Petofi, attacks his opponents’ weaknesses with Seraut-like precision. Hallie is shuffled between homes, and his approach is to show her an era in which she has meaning waiting for her. David, growing up too suddenly and too fast, enjoys a playroom and alternate identity that literally turns back -- way back -- the clock. And Quentin gets a terrible, manipulative girlfriend. There’s a reason that Commander Riker turned away Q’s powers on TNG and Dr. Chidi Anagonye rejected Michael’s “opposite tortures” on THE GOOD PLACE. As anyone who falls into the gifting reciprocity trap can tell you, it’s never good. Yes, there is some mystery and suspense, if fatalistic. This sequence is as much a chance to actually “be” with the characters, and the combative David/Hallie sequences are offset by the ones with Quentin and Julia. Where do the latter go to think? Of course, Quentin would go to a cemetery, and what’s that like for him, even under normal circumstances? He remembers so many of the years on both ends of these lives. And, of course he would flirt with Julia. For Quentin, she’s an unthinkably younger woman. When Quentin muses about needing a woman, Julia says he wants a drinking partner. Perhaps she’s missing a drinking partner and hinting for one, and he’s hinting as well. Of course, he puts down his glass, she drops the subject, and everyone remains good, sober friends. 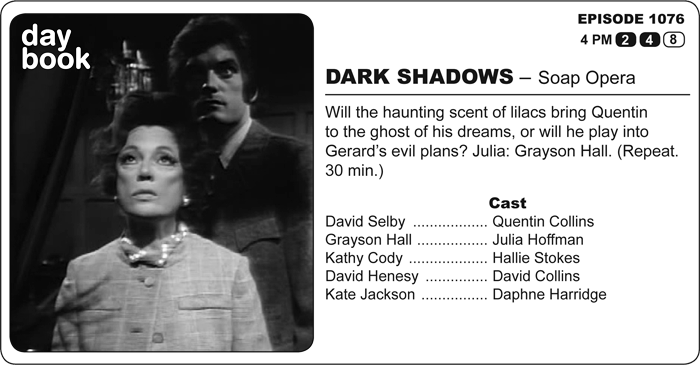 No wonder this doesn’t feel like traditional DARK SHADOWS. Is this padding? You bet. Is it padding with great characters and touching, revealing moments? Right again, and it’s worth it for that. This episode hit the airwaves Aug.10 , 1970.